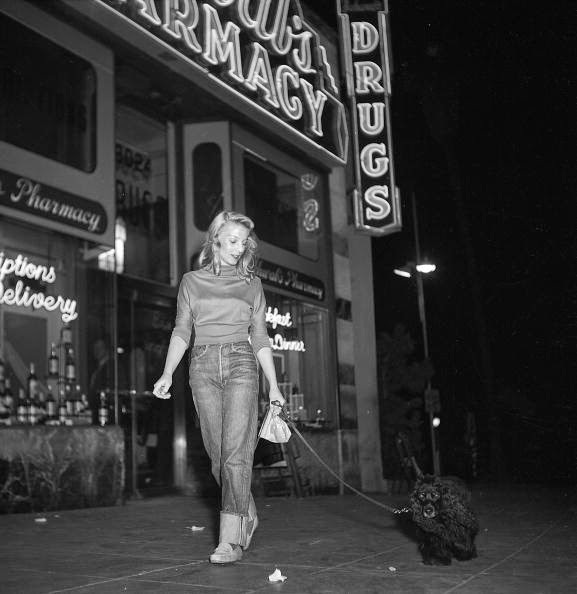 Schwab's Pharmacy on Sunset Boulevard was a Hollywood institution for 50 years. It was featured in the film Sunset Boulevard (1950). In this still you can see Norma Desmond's Isotta-Fraschini parked outside the famed drugstore. 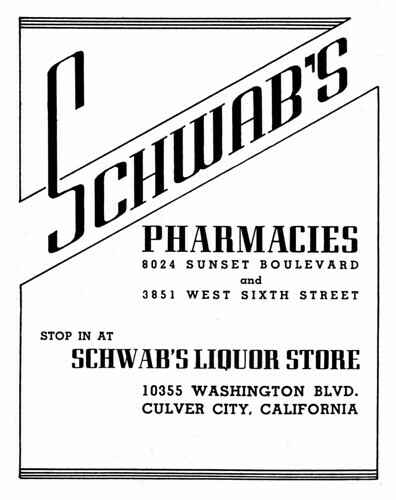 Schwab's Pharmacy quickly became Hollywood's unofficial headquarters after it opened in 1932. Everyone who was anyone hung out there, including Charlie Chaplin, Judy Garland and Orson Welles. Schwab's famed soda fountains were also a hangout for struggling artists waiting for their big break, like down-on-his-luck screenwriter Joe Gillis (William Holden) in Sunset Boulevard (1950). Gillis wryly refers to Schwab's as "headquarters" in the film. "That's the way a lot of us think about Schwab's" he says in a voice-over. "Kind of a combination office, coffee klatch and waiting room. Waiting, waiting for the gravy train." 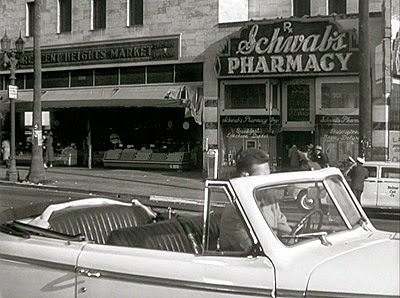 William Holden pulls up to Schwab's Pharmacy in Sunset Boulevard (1950). Schwab's opened in 1932 when Philadelphia natives and brothers, Jack, Leon, Bernard and Martin Schwab, bought a failing pharmacy on the corner of Sunset and Crescent Heights boulevards. The pharmacy was located just around the corner from several studios and the brothers set up their pharmacy to cater to the Hollywood crowd. Schwab's was more than just a place to fill prescriptions: there was a grocery store, a make-up counter (Gloria Swanson bought all her cosmetics there) and a restaurant that served all-American fare like hamburgers and meatloaf (Marlon Brando and Orson Welles were fans). Schwab's famous soda counter attracted big-name celebrities like Ava Gardner (she liked to help out behind the counter), Charlie Chaplin (he liked to mix his own special sodas) and Humphrey Bogart (he was looking for a hangover cure). Schwab's also catered to the movie industry by having a mail service, a check-cashing service and a paging service so agents could quickly find their clients. The Schwab brother's legendary kindness was the biggest draw for struggling artists. The brothers extended unending lines of credit to those waiting for their big break and they never turned away hungry person. "My mother told us if anyone needed, give, never turn down," Leon said. Soon several legends, some true and some imaginary, grew up around Schwab's. On the true side: songwriter Harold Arlen did pen Somewhere Over the Rainbow at Schwab's, or rather just outside. Arlen was working with his partner E.Y. Harburg on the music for The Wizard of Oz (1939) when he had a sudden inspiration one evening while driving to the movie theater. He pulled over outside Schwab's and penned the lyrics to the now legendary song under Schwab's neon sign. 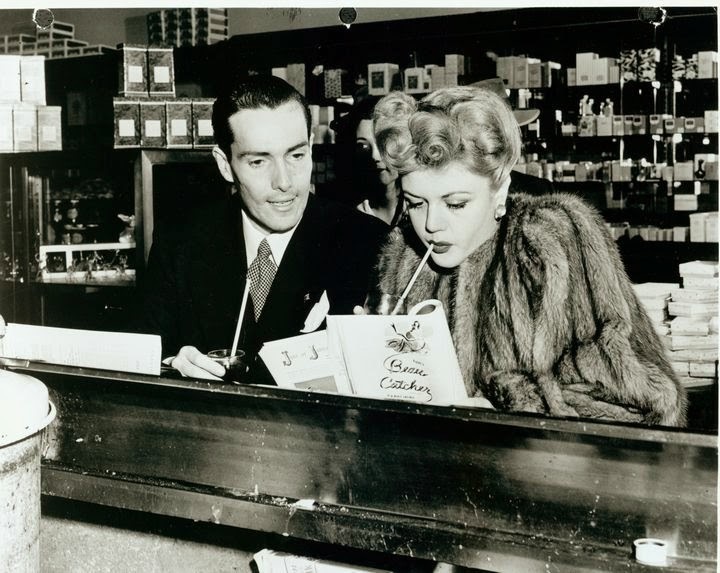 Hurd Hatfield and Angela Lansbury at the soda counter at Schwab's Pharmacy. One of the most enduring legends about Schwab's isn't actually true. For years, the MGM publicity department pedaled the story that Lana Turner was discovered by director Mervyn LeRoy while sitting at the soda counter. The 17-year-old beauty was actually discovered at the Top Hat Cafe by Hollywood Reporter publisher Billy Wilkerson. A 1930s ad for Schwab's Pharmacy. By 1950, Schwab's was such a Hollywood institution that Billy Wilder insisted on using the famed pharmacy as a location in Sunset Boulevard. The exterior shots are of the actual pharmacy, but the interior scenes were filmed on Paramount Pictures' back lot in a meticulously re-created version of the drugstore. 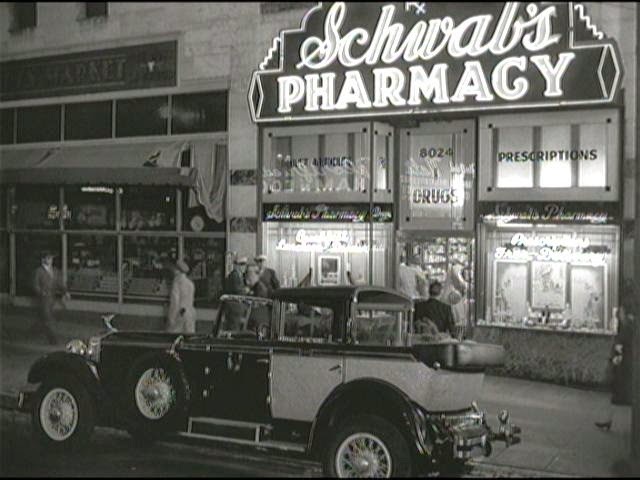 Schwab's was also featured in Andrew Lloyd Webber's musical version of Sunset Boulevard with an entire number located at the pharmacy (clip below). Schwab's continued to be a popular hang-out well into the 1970s with luminaries like Cher, Linda Ronstadt and Diane Keaton frequenting the Hollywood hot spot. Schwab's closed in 1983 and the building was torn down in 1988 to accommodate a new strip mall. There have been plans to revive Schwab's through the years, but nothing has come of it as yet. Sources for this article were The New York Times archive and laist.com.